Hotel "Chayhana", decorated in Oriental style, is located on the beach, 200 meters from the Genoese fortress of the XIV century. 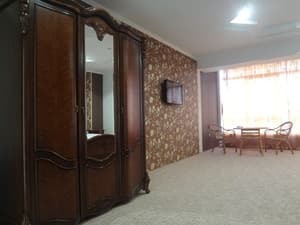 All rooms at the Hotel Chayhana are decorated in neutral colors with oriental patterns and are equipped with air conditioning and a flat-screen TV. The bathroom includes slippers. It offers free Wi-Fi and a restaurant with a terrace. The restaurant of the hotel "Chayhana" serves Eastern and European cuisine, and its summer terrace offers live music. The Aquapark and the Dolphinarium are only 3 minutes' drive from the Chayhana Hotel, and the sandy beach is 50 meters away. A shuttle service to and from Simferopol Airport is available on request (113 km). Description of the room: Spacious one-room with a double bed, wardrobe, plasma TV, rattan table and chairs. 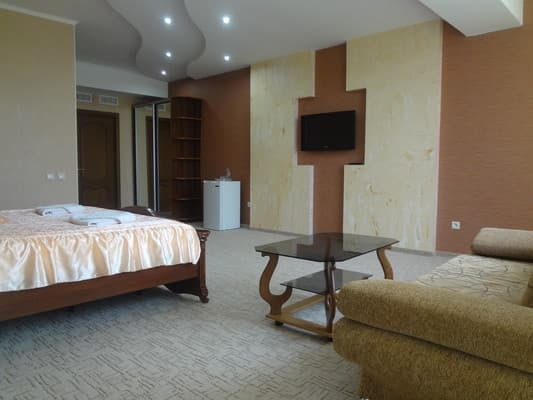 Description of the room: Spacious room with a double bed, a folding sofa, a wardrobe, a coffee table, plasma TV. 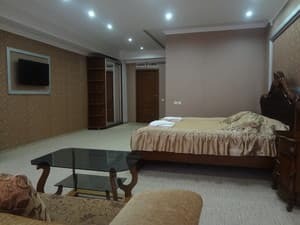 Description of the room: Comfortable spacious room with a double bed, a folding sofa, a wardrobe, a coffee table, plasma TV. Description of the room: The room consists of a bedroom and a living room. 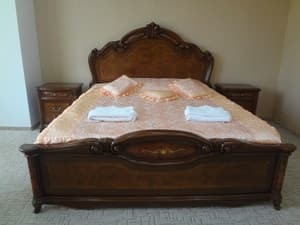 In the bedroom there is a double bed, in the living room there is a convertible sofa, a wardrobe, a plasma TV, a coffee table, a rocking chair. Accommodation of children under 3 years without extra beds is free of charge. On the well-arranged embankment of Sudak in 50m from the beach, 200m. from the fortress, on the seashore is the modern building of the hotel Chayhana. 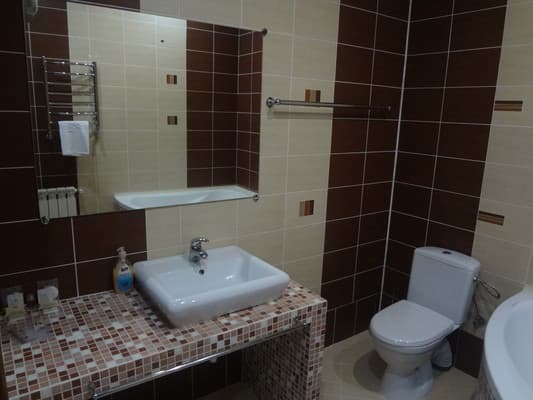 The hotel has comfortable rooms of four categories, each of the rooms is equipped with modern furniture, plumbing, air conditioning and household appliances. All rooms of our hotel in Sudak are equipped with panoramic windows, from which a breathtaking view of the sea or mountains. 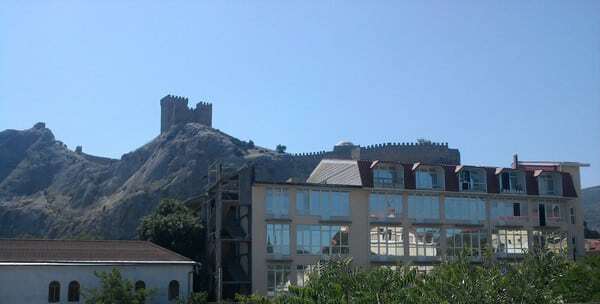 Hotel Chaykhana in Sudak is famous for its good restaurant with live music, located on the first floor of the building. In summer, summer tables are set on the terrace next to the embankment. 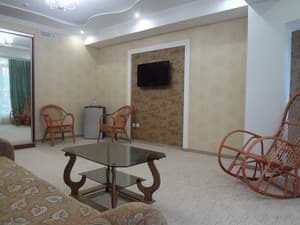 Not far from the hotel is a lot of entertainment, including a water park, attractions, Sudak Historical Museum, bowling clubs, recreation parks, nightclubs and much more. On the beach in front of the hotel a large selection of beach rides. Private hotel Chayhana and rest on the seashore will give a lot of unforgettable impressions and will definitely make you return to Sudak again! To the airport of Simferopol - 125 km, railway station of Simferopol - 113 km. The nearest railway station is in Feodosia. From here, take the bus to Sudak via Koktebel. Travel time is about 45 minutes. From Simferopol: near the railway station (exit to McDonald's, in the direction of the tower with a clock) are auto- and trolleybus stations. From there, a regular bus (journey time is 2 hours 30 minutes) or a fixed-route taxi.